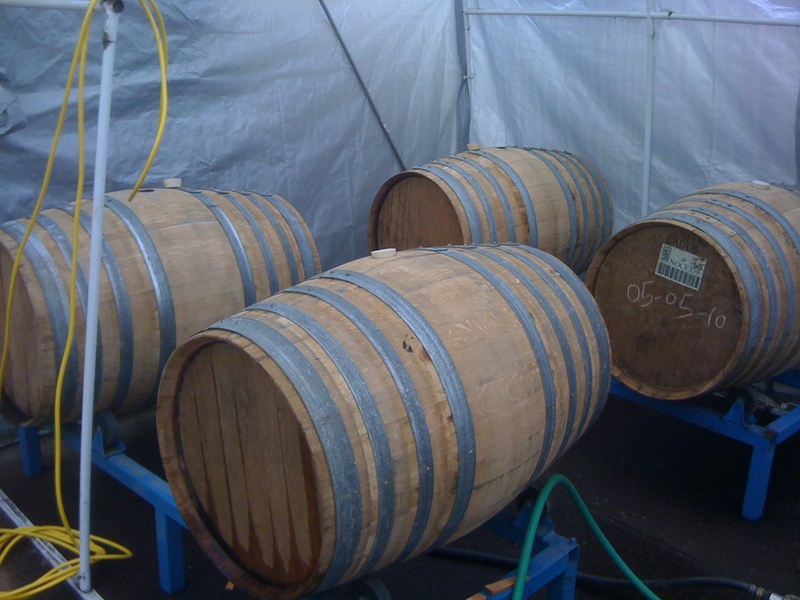 Anne Hubatch of Helioterra and I took a field trip recently to reWine Barrels in Salem, OR. What an interesting visit. 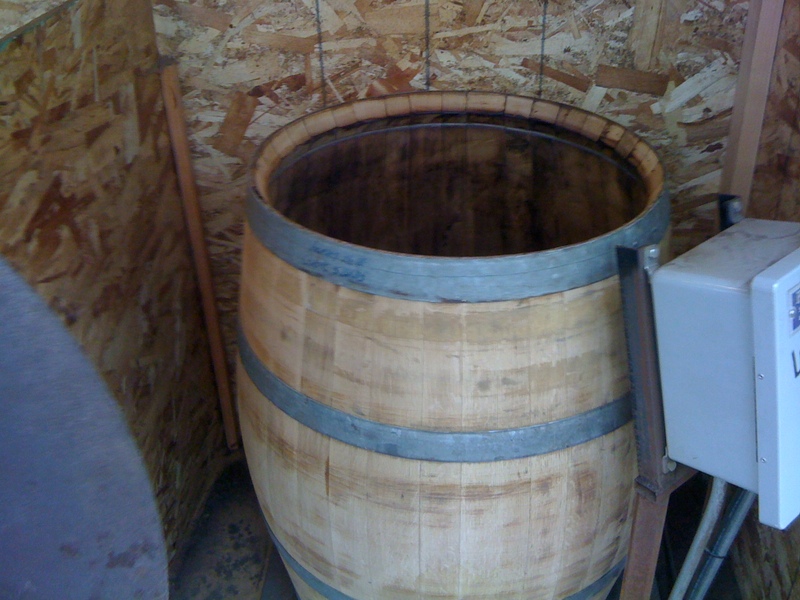 reWine is the barrel refurbishing business of father-in-law and master woodworker Todd Dollinger and son-in-law Trent Thomas, a former New Seasons wine buyer among other wine industry experience. I bought a rehabbed barrel from reWine for the 2009 harvest and I'm buying another one for 2010. I like the idea of recycling barrels. As Todd says emphatically, it doesn't make sense to cut down seriously old French oak trees to make barrels that you use for a few years and turn into planters. Renewing those barrels makes sense. Plus, I like the results I've seen. And the cost doesn't hurt. 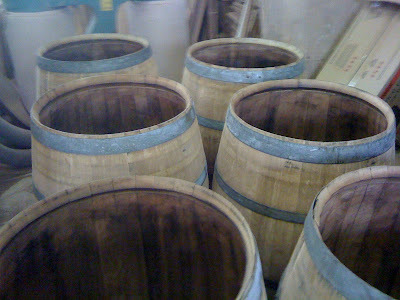 Rehabbed barrels aren't the same as new barrels, but they're pretty close and cost only a fraction of new wood. 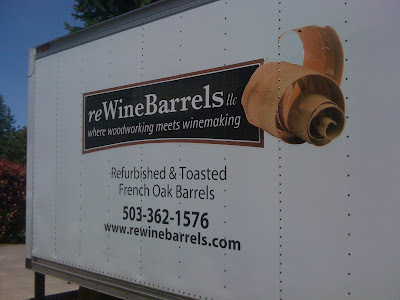 The reWine truck, usually full of barrels for delivery all over the Willamette Valley, just back from another drop. 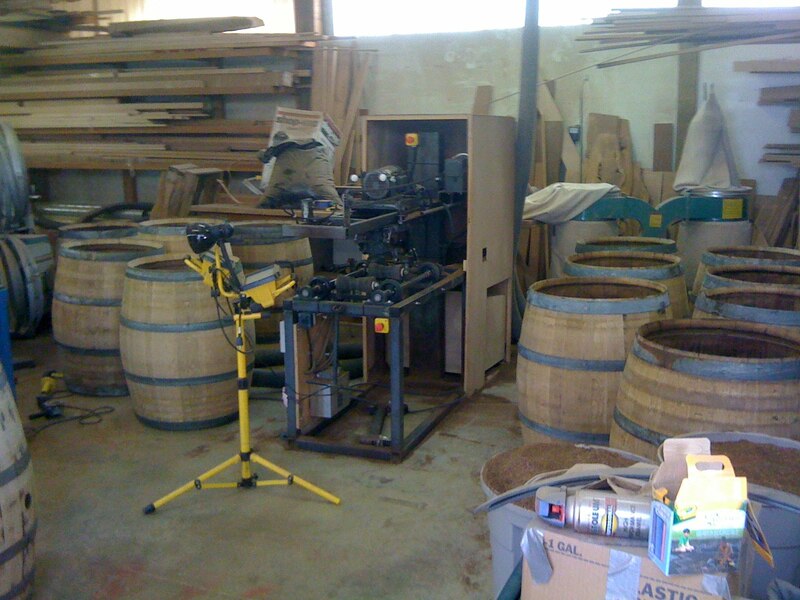 Inside the workshop are barrels in various stages of rehabilitation. 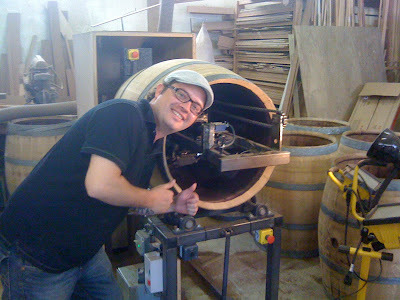 Todd animatedly shows off his self-made barrel shaving machine. A barrel is loaded on sideways and gently and fairly quietly shaved, back and forth across the grain with the barrel rotating slightly with each pass. Trent hams it up near the shaver. This machine saves lives and limbs, as early experiments with handshaving were a bit perilous. As you might expect, there's hand shaving to touch up what the machine doesn't quite get. Barrel heads are also resized to fit snug with the slightly reduced dimensions of the shaved and ultimately retoasted barrel. Here's my 2005 Siruge barrel from my last homemade wine that's ready for toasting. Here's a look inside. The electrical element will slowly heat things up to more than 400F over 2 or more hours for a light toast. I'm interested to see how a more subtle toast will react with local Pinot noir. Most barrels out there are medium to heavy toast. 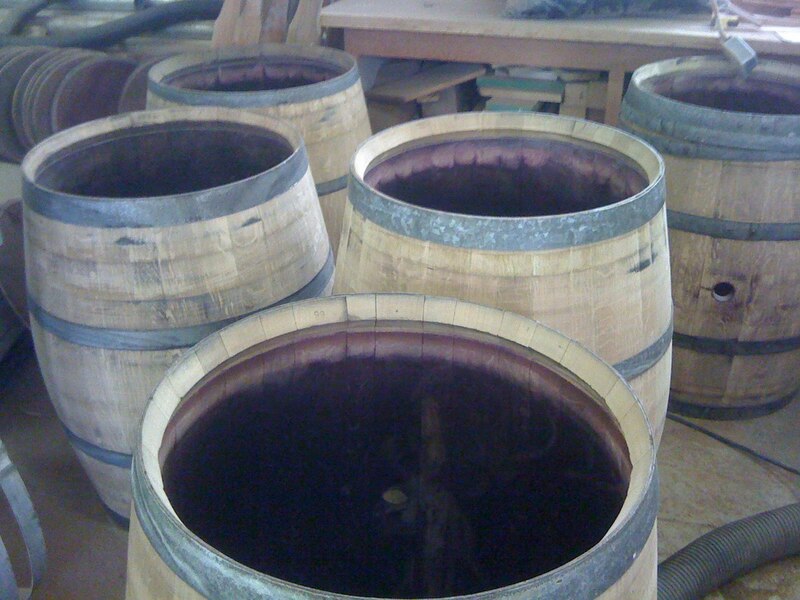 Over time, we check in on this barrel as it slowly colors and gains amazing smells of, well, toasty oak. Here's a barrel that's nearly done with a medium toast. I forgot to get pictures of my barrel as it finished up. Looks and smells good. Once they're toasted and reassembled, the refurbished barrels are filled with water to soak up. You can imagine the lengthy toasting process dries out the staves pretty good. Once they're water tight, they are drained, gassed with sulfur and wrapped for delivery. Todd and Trent talked a lot about the process and how they got started in 2009 combining Todd's knowledge of wood and machinery and Trent's experience with the wine industry. 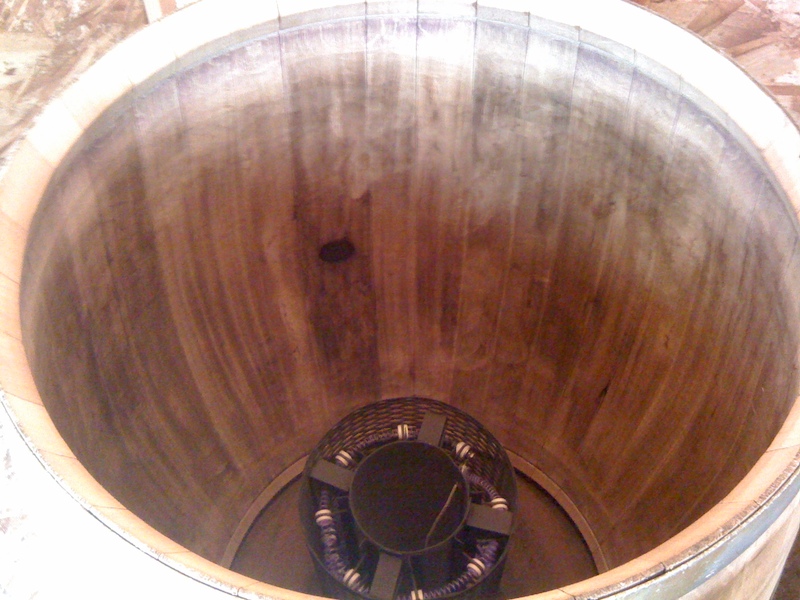 We talked about other barrel refurbishers out there who crank out more barrels per day and apparently don't spend nearly the time reWine does in toasting like a new barrel cooper does. reWine's trying to do things differently. This operation is obviously still very new but already it's impressive to see several local producers buying the product, or bringing their own barrels to get rehabbed like I did this time with my Siruge. It's a bit less expensive to do that. What impresses me most is the wholehearted commitment of Todd and Trent to their work. Todd's fanatic about the process. Trent's all about building long term relationships and making sure reWine is doing everything right to produce excellent barrels. These are people I'm glad to know and do business with. I can't recommend them highly enough. Thanks guys for the great visit. probably a good thing in reality anyway. ned, good question. I'm not into oak flavor so much either. The real goal of barrel aging is the curing aspect it gives to the wine. 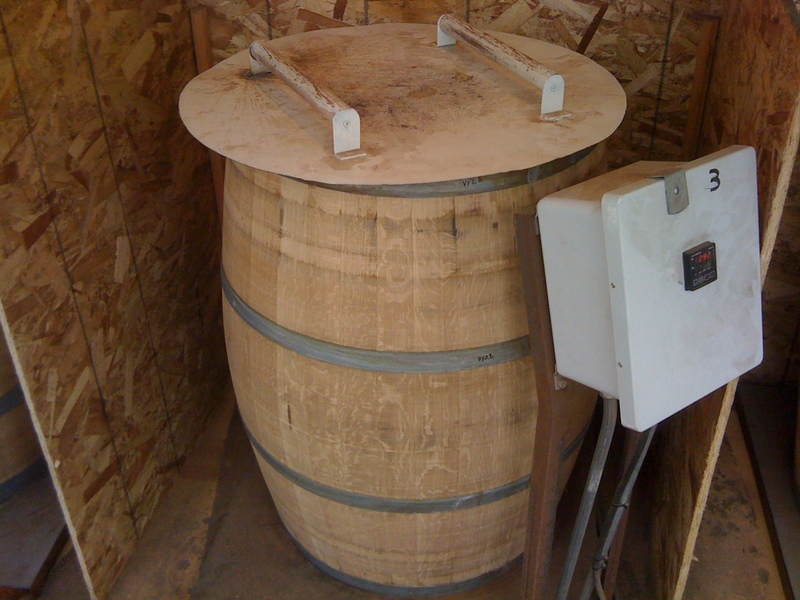 Barrels are most pourous when new. As they age, they become less so. A rehabbed barrel doesn't bring things back to "new," so that's different than an actual new barrel. I'm not sure which is preferable, but that's a different. Also, the toast level and quality in a rehabbed barrel is different from the original cooper. 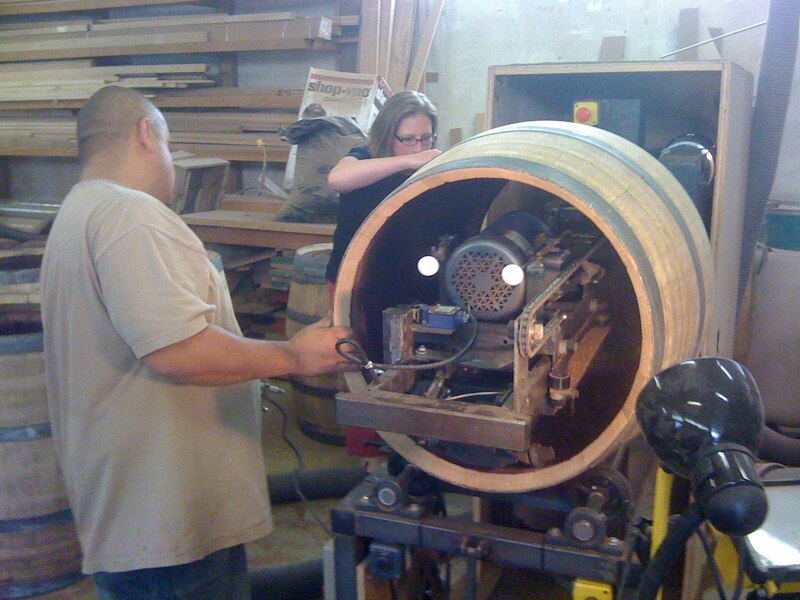 One place where reWine will continue to advance is quality and consistency of toasting the barrels. It's an art. Great write up Vincent, thanks! 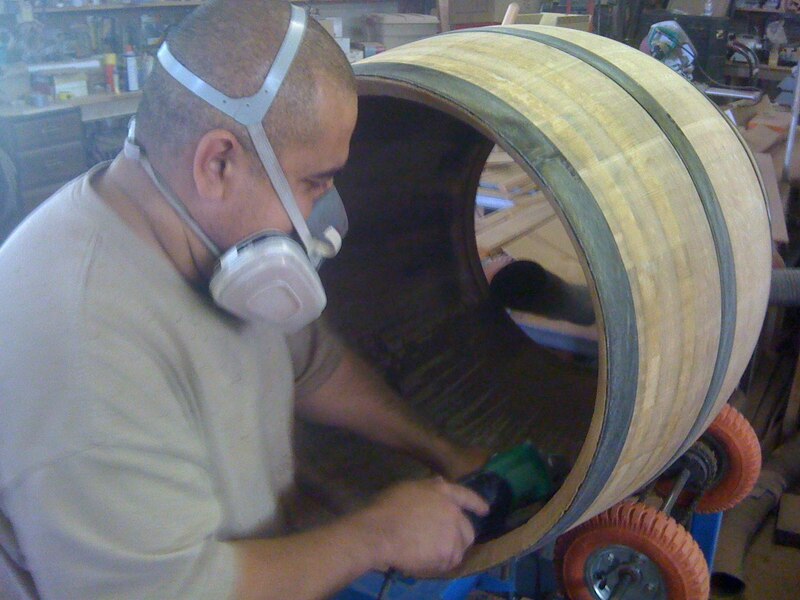 I have also been intrigued with the possibility of refurbished barrels for many reasons (cost, as you mentioned, environmentally friendly/sustainable, possibly less oak influence on the wine, etc). The pictures and info you provided is greatly appreciated! 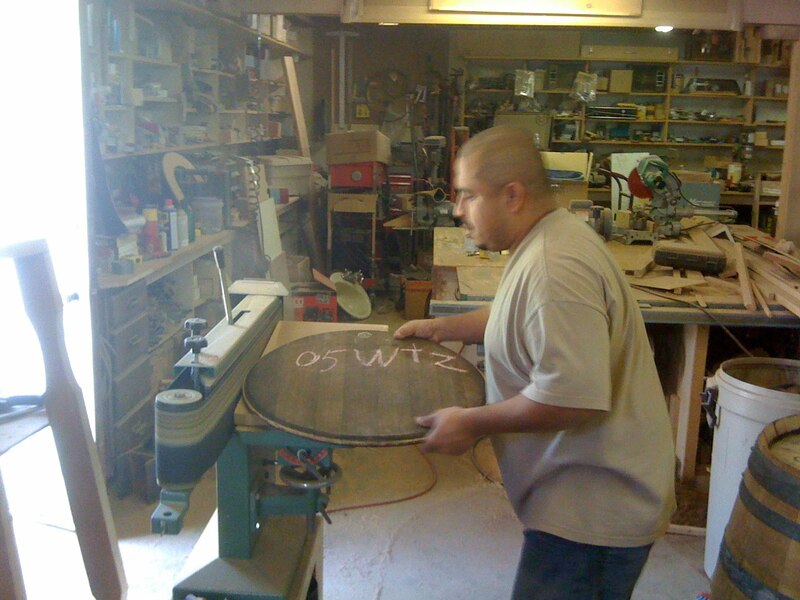 Since I only drink the wine its pretty cool to see the tasks of a maker. Thanks for the education and sharing the experience. Tom, that's exactly what I'm looking for with this blog. Education and sharing the wine experience. Thanks for reading and commenting. I am a local (Portland) craftsman and had the pleasure of visiting reWine where Todd was gracious enough to give me a one-on-one tour of his facility and their process of reworking barrels! First off, Todd is a genius! 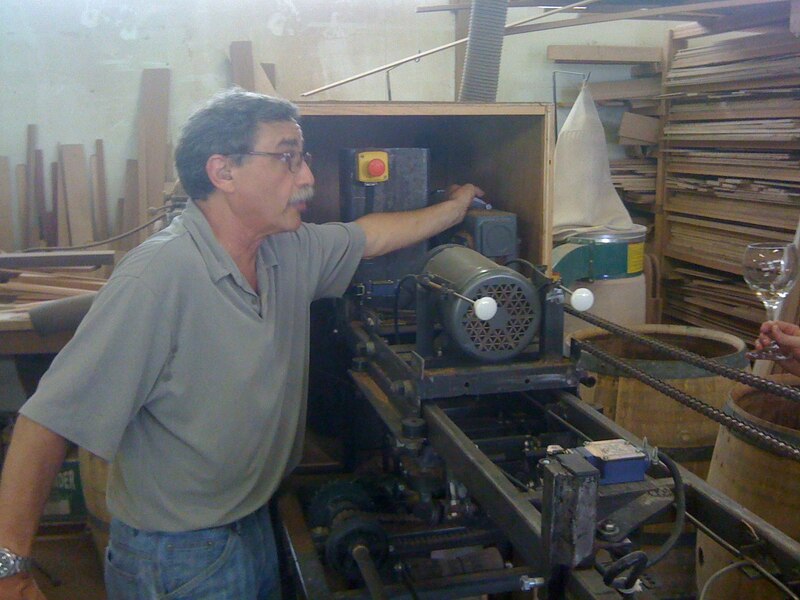 His expertise in woodworking and ingenuity for mechanical engineering is amazing. I was only expecting to pick up a load of wine barrels damaged in the 2014 Napa Valley earthquake that were no longer suitable for their intended purpose of aging wine or spirits. But I got so much more on my field trip. Becoming acquainted with Todd and learning what it takes to cooper a barrel was a real eye opener and I cannot wait to return as I receive more orders for my custom salvage barrel furniture and functional decor. You can see my work on my little website at 4Rnorthwest.com and follow my work more up to date on Instagram @4rnorthwest. A very big thank you to Todd for his services and providing me a green, responsibly harvested material that fits my work philosophy so well it's in our business name! Recycle, Reclaim, Repurpose, Reuse. 4R Northwest. For our Northwest!